MDC secretary-general Douglas Mwonzora has been nominated to remain in his current position by one province, which has left Nelson Chamisa without a challenger for the party presidency two weeks before the close of nomination. Eleven more provinces, nine local and two foreign, are yet to present their nominations as violence and allegations of manipulation continue to rock the opposition party’s nomination processes. Mwonzora, whose name was missing on the nomination paper by the United States branch, bounced back after Matabeleland South nominated him to his present position. Both the US and Matabeleland South branches have nominated Chamisa for the top post. Tendai Biti, who was surprisingly excluded on the US nomination list, has come back in the fold after being nominated for the deputy presidency alongside Morgen Komichi and Welshman Ncube. In Matabeleland South, sources told NewsDay that Mwonzora and deputy treasurer-general Charlton Hwende were both nominated for the secretary-general’s post, but the incumbent came up tops, polling in excess of 500 votes against Hwende’s less than 10. Mbizo MP Settlement Chikwinya was nominated as Mwonzora’s deputy, while MDC chair Thabitha Khumalo was nominated for the chairperson of the party and deputised by youth leader Happymore Chidziva. Party spokesperson Jacob Mafume confirmed the nominations and admitted Chamisa remained without a challenger for now. “Yes, it is true, that is the Matabeleland South list. What that means is that a single nomination means one is now on the voters’ roll at congress. If someone is nominated for two positions, they have to accept only one. We are now in Matabeleland North and all is moving on well,” he said. Mafume added: “We will be doing Matabeleland North and Midlands this week and we are hoping to finish the whole process in the next two weeks. We are happy with the way the congress has happened and we are happy that democracy is being shown. We are happy with the people, how it is peaceful, how jubilant and expectant as we retool, re-machine and fine-tune our machinery so that it becomes fit for purpose. According to the party rules, Mwonzora will have to reject the nomination for the secretary-general position and challenge Chamisa for the party presidency if he gets a presidential nomination. 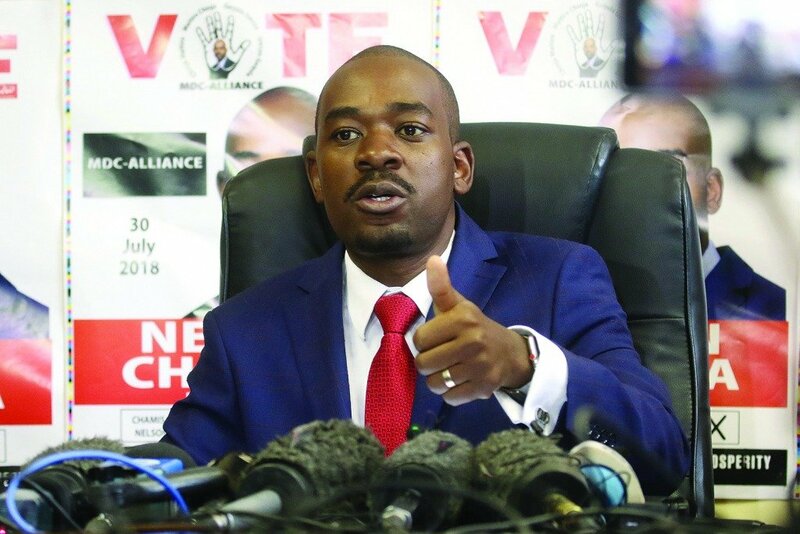 Meanwhile, chaotic scenes continued to rock the MDC provincial congresses, some degenerating into violence amid accusations by some party officials believed to be backing Mwonzora that the nomination process was being manipulated to give Chamisa and his loyalists a head start. In some areas in Masvingo, Mwonzora’s sympathisers claim elections had been suspended and some names of people backing Chamisa were hand-picked to represent the party at congress. This comes at a time violence was recorded in some districts at the weekend, particularly in Marondera and Chiredzi that has resulted in injuries of party members and damage to property. There were also allegations that the party’s organising secretary Amos Chibaya, who is conducting congresses, was aligned to Chamisa and was manipulating party systems to give the youthful leader an unfair advantage. “The district congresses are shambolic,” one official said. An MDC election in Marondera turned violent on Sunday after rival camps clashed over positions, resulting in one of the officials’ car being stoned and damaged. Police has to be called in to quell the clashes, resulting in the arrest of a suspect. Ward 4 councillor Charles Ngwena’s vehicle was damaged in the skirmishes after rival camps clashed at the party headquarters during the district elections. MDC Marondera district spokesperson Farai Nyandoro yesterday confirmed the clashes, saying those involved were sent from outside to cause disturbances. “We condemn violence with the contempt it deserves. Some arrests were made and indications showed us that an outside force was behind that. A vehicle belonging to councillor Charles Ngwena was stoned and its headlights shattered. Nobody really knows why the vehicle was stoned, but Ngwena is known as an influential opposition figure in politics,” Nyandoro said. Ngwena, who retained the district youth league chairmanship position, said his car was damaged extensively and that one of the suspects was arrested by the police. The build-up to the congress has been marred by violence in most areas including Harare and Chitungwiza. In Masvingo, the Chiredzi district congress that was supposed to be held at Town House was called off on Sunday after party provincial youth chairperson, Phillip Chingini, allegedly disappeared with the list of structures. The list was meant for the accreditation and verification exercise during the district election, according to provincial secretary for elections Callisto Musendekwa. The exercise, that started late in the afternoon was marred by controversy, heated verbal exchanges as well as pushing and shoving as disgruntled members sought audience with provincial members. The district was supposed to elect its executive and nominate its presidential candidate ahead of the elective congress slated for next month. Musendekwa’s speech was continually drowned by angry voices from the gallery, complaining about the district chair, James Kampota, accusing him of failing to properly handle elections in ward 5 and 8, resulting in them coming to a district election without structures.